The world is a big place, but so is the Internet. We know which countries are the largest in the real world, but what about on the Internet? This article examines which countries are the largest in terms of Internet users, and also looks into their growth potential. That last point is very interesting to look at because it’s an indication of how the power balance on the Internet might shift in the future. But before we head on to the charts, let’s start with a few interesting findings. Here are some standout facts and observations that give additional perspective to the Internet usage of the top countries on the Internet. There are a total of 1.8 billion Internet users in the world. There are 32 countries with more than 10 million Internet users. The top 10 countries on the Internet together have 1.17 billion Internet users. That’s 65% of all Internet users in the world. The top 20 countries on the Internet together have 1.47 billion Internet users. That’s just under 82% of all Internet users. India is the fourth largest country in terms of Internet users in spite of having an Internet penetration of a measly 6.9%. This thanks to its huge population. 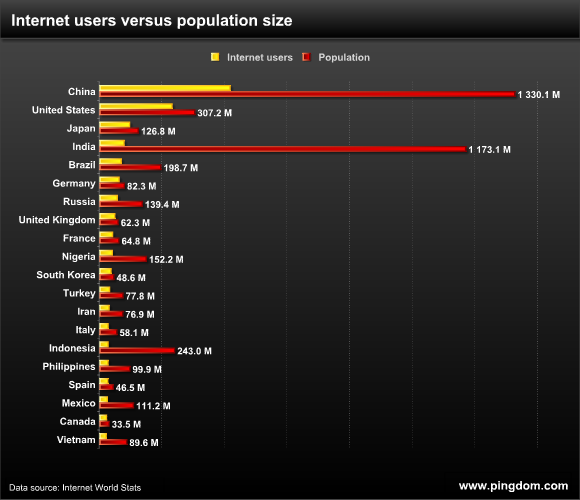 China takes the top spot both in terms of population and Internet users. China has almost twice (1.8x) as many Internet users as the United States. 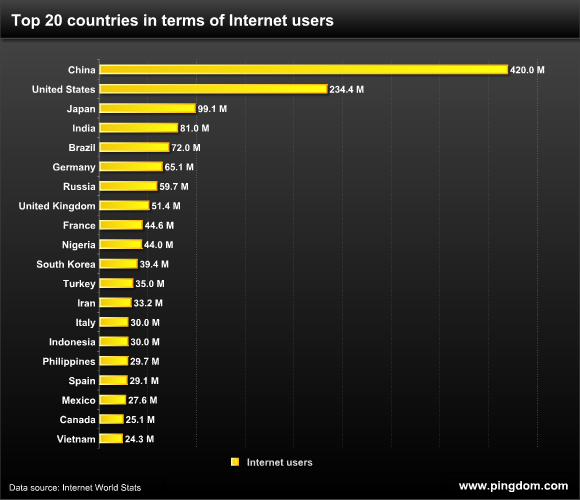 China together with the United States, the top two countries, make up half of the Internet users in the top 15. Out of the top 20 countries, the five with the highest Internet penetration (not users) are: United Kingdom (82.5%), South Korea (81.1%), Germany (79.1%), Japan (78.2%), United States (76.3%). By Internet penetration, we mean the share of the population made up of Internet users. The Internet is almost like its own world, so when you’re thinking about what countries are the largest in that world, it makes sense to count Internet users instead of real-world population. Not only is China the largest in terms of real-world population, the country also has by far the largest number of Internet users. This may not come as a huge surprise, but looking past the absolute top of the list, there are some countries that may be unexpected residents in the top 20. The tenth largest country on the Internet is Nigeria. So although Africa as a whole is often considered to be a bit behind the curve on the Internet, it does have a presence among the top countries. Seven out of the top 20 countries are Asian (35%). Five out of the top 20 countries are European (25%). Six (30%) if you also count Russia. Three of the top 20 are English-language countries (four if you count India). We thought it would be interesting to show you the number of Internet users these countries have in relation to their actual population size. The below chart clearly shows how much the Internet penetration differs between countries. Why even look at this? One word: potential. This chart identifies which of these countries have a lot of growth potential on the Internet, and which don’t. Note: This chart is still sorted by Internet users, so it has the same order as the previous chart. Countries where Internet users make up a minority of the population have a larger growth potential than countries where Internet users are in majority. This has big implications for the future. Many of the more developed nations already have a high Internet penetration, having already converted most of their population to Internet users. Look at the United States, Japan, Germany, the United Kingdom, and so on. Their size on the Internet has little room for growth. But look at countries like India, China, Brazil, Vietnam, the Philippines, Russia. As the Internet penetration in these countries rise, the balance of power on the Internet will start to shift. In five to ten years, the order in the top 20 list will be quite different. The Internet is a truly global phenomenon (which probably hasn’t escaped anyone), so it’s nice to see countries from all parts of the world in the top 20 we presented here. We hope we have given you some insight into what the Internet of today looks like in terms of Internet users and nationalities, and hopefully also some food for thought about the future. I never would have guessed that Mexico and Vietnam have a similar online population to Canada. The last chart should have been sorted differently by the ratio. It is misleading to keep the order while the chart is representing a different concept. As a side note, Germany, United Kingdom, Italy, Spain etc.. are still considered single countries. If we consider them “European union”, which is how they should be considered, they account for at least as much internet users than united states, probably more. I haven’t checked the numbers of the entire list, but counting only those listed in the top 20 there are already 213 milions of users, which make me think that adding other smaller/less conencted countries (there are more or less 20 more) probably Europe is the second country (and Euro the second currency) on the internet. @SimoneGianni: While you have a point that Europe, or even EU, as a whole is big, you have to keep in mind that these countries are much more differentiated than American states. Different languages, different cultures, etc. The Chinese figures are very inflated as is the Chinese census. China projects itself like a puffer fish from behind its wall to the outside capitalist world but that puffer fish is deflating with every passing year. @Pingdom that’s absolutely true, I live there so I know :D.
I don’t know how much northern and coast parts of China or India are differentiated, I only know for sure they too have many different languages and cultures. But this is not the point, there are many other POVs that could be considered. The point I was making is that “Euro zone” can be often be considered a single “market”. Many companies are not differentiating pricing in the EU anymore, when they sell on internet they have a single price in Euro. Considered this way (which again is just one of the possible ways, but I think it is worth considering), Euro-spending-people seems to be the second biggest population on internet. This does not mean the “biggest market”, cause EU people tend to spend on the internet much less than people in the US. Also from a technical POV considering EU as a whole instead of single countries is gaining more and more sense: I’m currently connecting from Italy with a British Telecom line, so whether “internet is good or not” in UK directly influences my daily net experience, not counting mobile markets which are even more deeply interconnected. Great insite. Does “internet users” tie closely to “internet shoppers”? In other words, are there 1.8X China Internet Shoppers or are these users just hanging out on youtube, checking email and reading the latest lifehacker article? @jrr: Purchasing power is bound to differ from country to country. As for mapping the behavior of all of these Internet users… that would be a biiig undertaking, if it’s even possible to do reliably. It would be interesting to know, though. Where would Nigeria place if you omit people who use it only to recruit foreigners to help with bank transfers? Excellent and informative article. Insight into Internet penetration and usage rates globally. I teach telecommunications throughout the world and will share these stats with the participants (some of whom are from countries like Nigeria). Great article, learnt some useful info. Thanks for sharing! Thanks for your indi about internet population. I’m intrigued by the fact that 5/6th of the UK population are apparently online (84%+) yet the UK government put the proportion of people under 16 at 1 in 5 (20%). Granted, the teens will be online, but a lot of older people won’t be, and some households might have one person who uses the Net (like a child) and the parents avoid it. It seems like that ends up with everyone who could be online being online in the UK! @SimoneGianni Readers of this article get more information by splitting out totals for the EU countries individually as opposed to lumping them all into an EU basket. As a reader, I prefer the extra data. It will be interesting to see populations by order-of-magnitude bandwidth levels. Millions with dial-up, 1Mbps, 4, 10, 25, 75, 100, 500, 1G. The experience of the Internet is qualitatively different once you have old school broadband vs. some of the fiber broadband services. Wow, 81 million users in India. Is this too high. I wonder where IUW gets their information from! @Jason the reason why you don’t notice the number of Mexican and Vietnamese users is that your Internet is in English and theirs probably not…..
Don’t be to sad, in Germany many people only get 0.375Mbit/s or even dailup via modem (56kbit/s). It appears that these stats do not differentiate between computer and mobile internet access which would account for the skewed numbers. Probably South Korea, they definitely have the fastest internet widespread. Though the graphs look interesting, every conclusion one might see necessarily contains such large caveats. For example, the apparently large potential for more Chinese is more a function of poverty than lack of interest or service. The growth of the Internet will stall once well-connected players (of the Communist regime) have it. At that point, its growth will be tied to economic improvement of impoverished areas. Consider: China’s province of Shanghai has a per capita GDP of $20,997, whereas Ghuizhou is $2682 ($223.50/mo!) Nigeria, *including* all its wealthy, is worse than Guizhou, at $2400. In such impoverished regions (see India, Indonesia, Philippines, Mexico & Russia etc.) the proper implementation of Capitalism is necessary to create the wealth that will enable Internet growth. Are you ready to bet on their politicians to make that growth possible?? In each nation, or economy, the income range of Internet users should be used to identify the population of low income users. Converting those incomes to a uniform currency, the potential for even lower income individuals or families to move into that lower bracket is a better indicator of potential growth in each nation. I wonder why people think this chart is a competition among countries. Some are even upset that their country didn’t make the top 20 list despite their strong economy, hence trying to group EU countries as one country (very funny indeed). It doesn’t matter what you feel the chart should be like, don’t be bothered that 3rd world countries made it on the list, forget about the buying power of each country or the bandwidth of their connection. Just mark this stat as a source and use it instead of fighting with it. Would be interesting to see the ccTLD volumes plotted against the internet population for each country. Or have you guys done this before?